Complex models are not always required for good control. Unfortunately, optimization methods, including methods based on H∞, H2, and µ-synthesis optimal control theory, generally tend to produce controllers with at least as many states as the plant model. Model-order reduction commands help you to find less complex low-order approximations to plant and controller models. In the design of robust controllers for complicated systems, model reduction fits several goals. Hankel singular values define the energy of each state in the system. Model reduction techniques based on Hankel singular values can achieve a reduced-order model that preserves important system characteristics. Model reduction routines are categorized into two groups, additive error and multiplicative error types. Reduce a model with balancmr and examine the resulting model error. 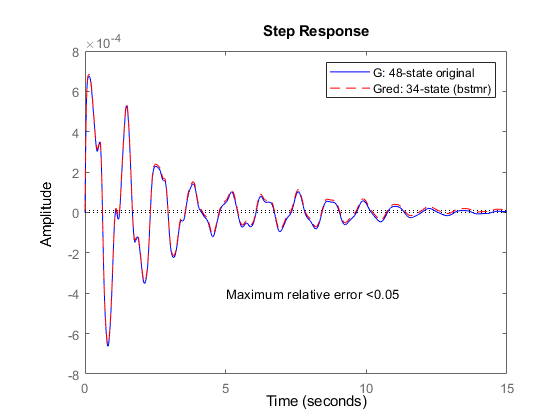 Reduce a model with bstmr and examine the resulting model error. modreal lets you reduce a model while preserving jω-axis poles. modreal can be the best way to start when reducing large models. Compute a reduced-order model by truncating a balanced coprime set of a model. Simplify uncertain models built up from uncertain elements to ensure that the internal representation of the model is minimal. Use Robust Control Toolbox™ to approximate high-order plant models by simpler, low-order models.